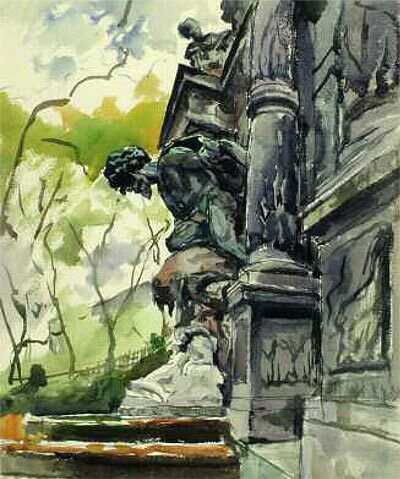 Five St. Petersburg museums - the Russian Museum, the Academic Research Museum of the Russian Academy of Fine Arts, the St. Petersburg Museum of Theatre and Music, the Yelaginoostrovsky Palace-Museum and the Russian Ethnography Museum - were exhibiting the works of Alexander Benois di Stetto (1896-1979). His works, never before shown in Russia, reaffirmed the reputation of the illustrious family of artists as the most significant, and artistically most prolific and versatile dynasty of its time. The 20th century was a time of international upheaval, and many ruined lives and hopes. The time of powerful social cataclysms devoured many human fates, which makes it especially important to recall at least one of them1. 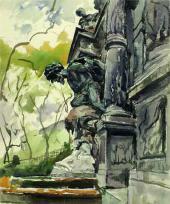 The Russian-Swiss artist Alexander Siegfried Borchardt Levy-Benois di Stetto lived a long life. His short "Biography", edited by the artist himself, reads that he "entered the 20th century at the age of four, and together with the new century lived through the major events in the history of art, and took part in them." He left behind no memoirs, and there are but a few letters left - barely sufficient to trace his life; but he responded to the world around him so eagerly and spontaneously, celebrating his impressions in his pictures so richly, that much can be learnt from his oeuvre alone. An offspring, on his mother's side, of the Benois dynasty, Alexander Benois di Stetto left Russia four years after the October revolution, never to return. But an amazing thing has happened: his works and a few heirlooms have been returned to his homeland to tell the story of an artist whose soul never forgot his native country. Few among Russian connoisseurs of art know the name of Alexander Benois di Stetto, although he always thought of himself as a Russian artist, from the talented dynasty, and was so proud of his heritage that he eventually obtained permission to bear his maternal surname - Benois. His mother, Clara Alissa Benois, was born in 1867, the youngest, fifth child in the family of Alexander Leontievich Benois and Maria Friksen. They lived for a long time in Germany, hence their family nickname "the Hamburgers". Alexander Nikolaevich Benois, the famous artist and critic, in his memoirs devoted several pages to some of his distant relatives. He was a nephew of Alexander "the Hamburger". Reminiscing about his uncle, he writes that his father felt toward his brother "a special tenderness". The brothers resembled each other not only in appearance, but also in their "spiritual makeup, artistic streak"2. Clara Alissa married Siegfried Levy, who knew the Benois family well and held in high esteem their values. Grigory (Siegfried) Yakovlevich Levy (1850 - after 1923) was an architect -he studied in the Munich politechnical school, and from 1878 worked for the famous St. Petersburg architect Leontiy Nikolaevich Benois (1856-1928). 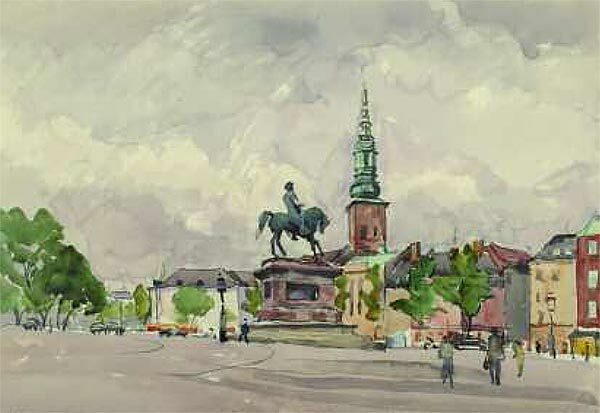 Levy worked on commissions from Baron Vrangel in the Kiev region and designed buildings for the city of Gus-Khrustalny. He was the architect of the Sestroretsk health resort. 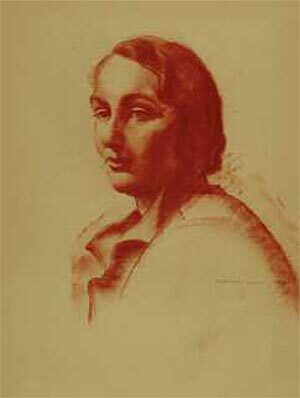 Zinaida Yevgenievna Serebryakova (a Benois by the maternal line) once said that in their family children were born with a pencil in their hands. Alexander Benois di Stetto, too, received his creative gifts from his architect father and the whole Benois clan. Alexander Siegfried Borchardt Levy was born in St. Petersburg on October 1 (13, by the old calendar) 1896. He showed a tendency towards drawing when still a young child - of course, hardly anyone among his relatives was surprised at that. Having received a general secondary education at Katharinenschule, Benois went on to study art. Alexander was not yet 18 when he matriculated from the School of the Society for the Encouragement of Arts directed by Nicholas Konstantinovich Roerich. The school's faculty included the famous engraver Vassily Mate, the art critic Sergei Makovsky, and the graphic artist Ivan Bilibin. Roerich himself taught a composition class. It was under his tutorship that Alexander began to grasp the secrets of oil painting, watercolour, pastel and sanguine. Classes in animal drawing also played an important role for Benois di Stetto. To teach this complex subject, Roerich enlisted the services of his old friend and a disciple of Arkhip Kuinji, Arkady Alexandrovich Rylov. Alexander Benois di Stetto's large and talented family was very important for the development of his artistic outlook. He had an opportunity not only to observe Zinaida Serebryakova at work, but also to paint under her guidance. In June-July 1916 Alexander and Yevgeny Levy were staying with Serebryakova. The Serebryakovs liked the brothers; Yekaterina Nikolaevna Lansere -Zinaida Serebryakova's mother - in a letter from Neskuchnoe to her husband characterized her distant nephews as "very nice and well-mannered". From Yekaterina Nikolaevna we also learn that Zinaida Serebryakova painted the young men. In 1918 Alexander Siegfried-ovich's life in art took a new turn. He began to study architecture at the Petrograd State Free Art Workshop, as the Academy of Fine Arts came to be named in 1918. The reorganization of the academic school could lead to an "unavoidable chaos", something about which Leonty Benois had warned. An experienced teacher - he had been teaching at the Imperial Academy of Fine Arts since 1893 - he decided to continue his educational activity. About 100 students enrolled at his workshop. 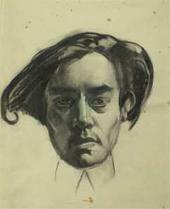 He planned to combine general and model drawing classes with a large variety of architectural tasks. Alexander was enthusiastic about his new profession. Meanwhile, however, the Art Workshop was to be reorganized yet again, and most horribly, Leonty Benois was arrested, with his wife and children. In 1922 the artist arrived in his father's ancestors' home country. The artist settled in a small alpine village. Alone, without work, and in a state of spiritual isolation, Alexander Levy spent probably the most difficult months of his life. In Bern, the big city to which he moved later, life was different. That was when he could fulfill his old dream of taking his mother's family name. 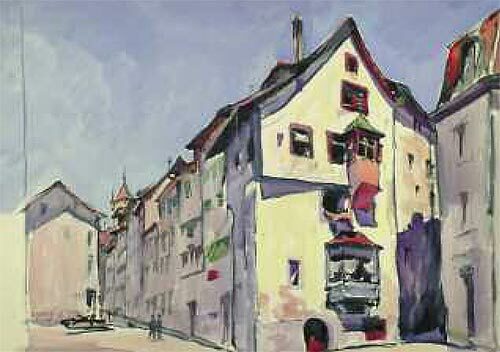 In one of the documents dated April 15 1923 the artist is named for the first time as a Swiss citizen Alexander Benois, although at that moment officially this surname was not yet granted him. From his first days in Bern the artist was busy working. He accomplished an important official commission - the portrait of the President of the Swiss Confederation Giuseppe Motta. 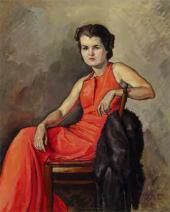 The portrait was finished in June 1923, and displayed at a city exhibition. Commissions for portraits started coming in, and the artist worked for the state gallery and received publicity. 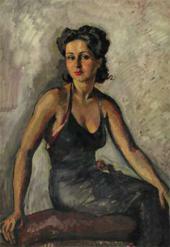 In 1925 to 1927 he lived in Paris, working mainly as a portraitist. Here he met his future wife - Camille (Kama), a concert musician. 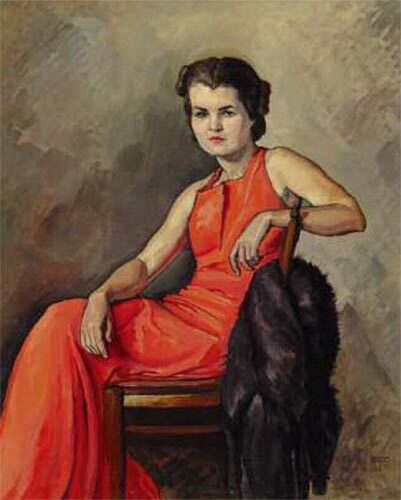 Becoming the artist's faithful companion, she, however, abandoned her own fairly successful career, focusing her life on her spouse's artistic pursuits. An invitation to Berlin, to the Deutsches Theater highlighted yet another aspect of his talent. In 1927 Alexander Benois di Stetto was awarded a Grand-Prix of the city of Berlin for designing the set for a production of Mozart's opera "The Abduction from the Seraglio." He worked with Max Reinhardt (1873-1943), and the famed director and actor found in Alexander Benois di Stetto a kindred spirit. At that period Benois di Stetto became involved with industrial design. Sketches for car bodies, and the decor of passenger vehicle compartments for fees became a new outlet for the master's talents. Certainly, these jobs paid well, but the maestro was especially attracted to large-scale experimental projects. Together with his spouse, Kama, he designed a two-cylinder revolving stage. He turned to new art forms and began to design cartoons for woven carpets. The intensity of his creative work, combined with active participation in Berlin's artistic life, led to fatigue. In 1929 this made the couple to return to Geneva, the city with which all their future life was to be linked. 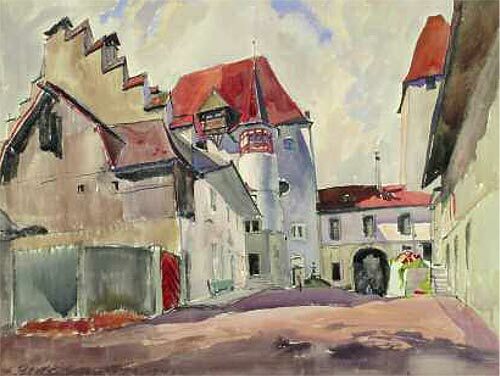 Their living was earned mostly by creating murals for public buildings and design, while landscape became the genre in which the artist perfected his artistic skills; it was in the late 1920s that Benois di Stetto became interested in watercolour, which became one of his favourite techniques. In Geneva the artistic circles recognized Benois di Stetto as an accomplished master. A busy creative life, and public activity took up most of his time in the 1930s. He never ceased painting landscapes: those from the area of Lake Geneva attest to the artist's skill in using saturated, sometimes spectrally pure local colour, and the richness of his colour scheme. 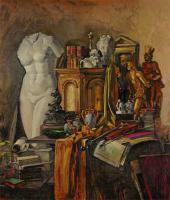 In the early 1930s Alexander and Kama Benois di Stetto visited Spain where the artist made many studies. In 1953 they spent several weeks in France. Paris, with its scenic environs became a major motif for a watercolour series, while a trip to Denmark resulted in landscapes of old Copenhagen. In the 1930s, already a famous portraitist, landscapist and monumen-talist, he suddenly turned to the still-life genre in search of interesting colourist findings. ("Still-life with Red Flowers" (1950), "Golden Flowers" (1 954), "Bouquet in Red" (1959)). 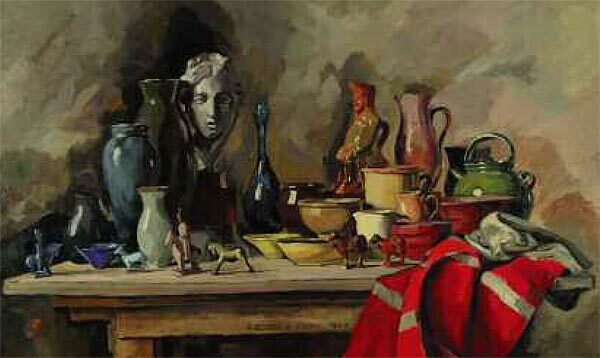 In the 1940s he created still-lifes with a balalaika, dolls, embroidered towels, and small ceramic horses ("Russian Still-life" (1943), "Small Red Horse" (1946)). Russian motifs are not typical for Benois di Stetto's work. During World War II the artist and his wife lived in neutral Switzerland, though, of course, Benois di Stetto had a distinctive viewpoint, which he expressed in the form peculiar to an artist. This series of "Russian" works includes "Still-life with a Portrait of Alexander I" (1944), distinguished for the refinement of its colour scheme. Alexander Benois di Stetto was a talented portraitist, and turned to this genre in the 1920s. 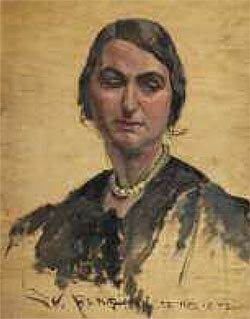 Initially, he painted mostly commissioned portraits of his neighbours, acquaintances and friends. In his notes the artist gives dozens of names, but does not provide descriptions. Thus his female sitters (the artist obviously preferred painting women) were often to remain "anonymous" ("Portrait of a Woman", "Portrait of a Lady in a Fur Coat"). The artist's wife Kama always remained his favourite sitter - and his portraits of her are marked with a special warmth ("Kama with a Cat" from the 1930s; "Portrait of Kama" from 1940; and "Kama at Rest" from 1941). The artist's numerous self-portraits are also of special interest. Benois di Stetto created an excellent series of animalistic graphic artworks. He made sanguine and water-colour pictures of exotic animals. His drawings are superb, with impeccable silhouettes. The pictures combine succulent curves with fine lines resembling a feather touch. Their texture is ideal, evoking the best animal pictures of the old masters. The artist chose sanguine, believing that its lively line would help to convey the distinctive movements of an animal. Although there is no indication that Benois di Stetto was familiar with the work of his contemporaries - like the outstanding masters of sanguine drawing such as Alexander Yakovlev and Vasily Shukhaev - the obvious affinity of the artistic techniques is immediately evident. This is yet another proof of the fact that even dozens of years later, the artist remained faithful to the Russian school. In the early 1950s he turned to new forms and motifs. An architect and an artist, he was becoming ever more interested in experimenting with volume and architectural forms. The avant-gardist dared to bring to life a new world of images, where the real and the imaginary blended to form a stunning symbiosis - his amazing "structures". For a show at the World Exhibition in Brussels in 1958, the artist made pictorial compositions, drawings and models - an artistic materialization of his dream about the City of the Future. The artist continued to develop his architectural fantasies and readily displayed his structural compositions at his solo exhibitions, which took place almost annually through the 1960s and 1970s. Remarkably, until the very end of his life the artist never lost his creative energy and interest in life in all its manifestations - a fact in itself very typical of all the members of the outstanding Benois dynasty. Alexandre Benois di Stetto. Strukturen gebaut gemalt getraumt. Suisse, Basel (no date), p. 46. Alexander Nikolaevich Benois. My Recollections. Books One, Two, Three. Moscow, 1980, pp.124-125. The artist's archive, private collection, St. Petersburg.